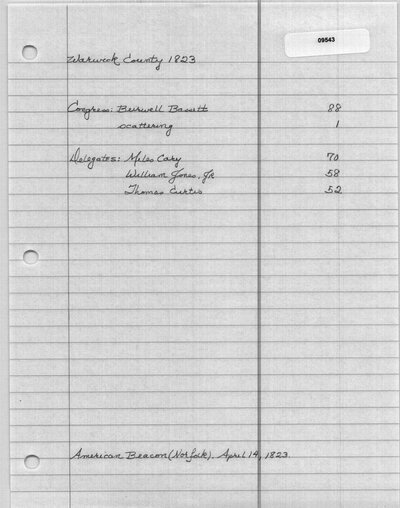 The Boston Weekly Messenger (Boston, MA) lists total votes as 1042 for Burwell Bassett, 750 for Abel P. Upshur and 5 for Robert Anderson. 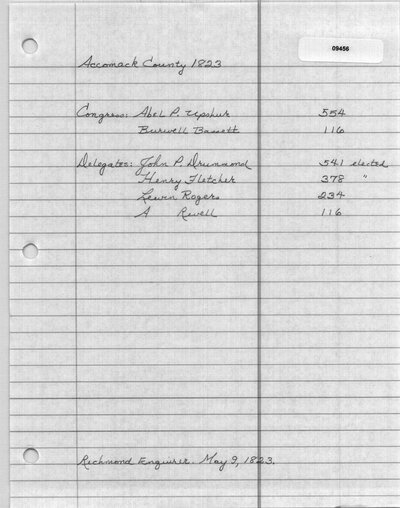 "We have not full returns from the county of Accomack, (the last in the York district) the election having been continued three days. On the first day, the votes were, for Upsher, 458, for Bassett, 14. Col. B's previous majority was abut 750. There is no doubt of his re-election." The Petersburg Republican (Petersburg, VA). April 15, 1823. Boston Weekly Messenger (Boston, MA) lists 20 votes for Burwell Bassett. At the time, Williamsburg was split between James City County and York County and was not yet an independent city. The votes in Williamsburg appear to have been reported independently of either county. Boston Weekly Messenger (Boston, MA) lists 150 votes for Burwell Bassett. American Commercial Beacon and Norfolk and Portsmouth Daily Advertiser (Norfolk, VA). April 10, 1823. Daily National Intelligencer (Washington, DC). April 15, 1823. Richmond Enquirer (Richmond, VA). April 15, 1823. The Petersburg Republican (Petersburg, VA). April 15, 1823. Alexandria Gazette and Advertiser (Alexandria, VA). April 17, 1823. The Alexandria Herald (Alexandria, VA). 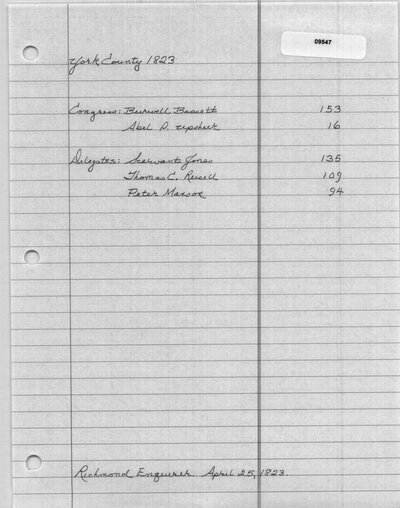 April 18, 1823. The Petersburg Republican (Petersburg, VA). April 18, 1823. The Petersburg Republican (Petersburg, VA). 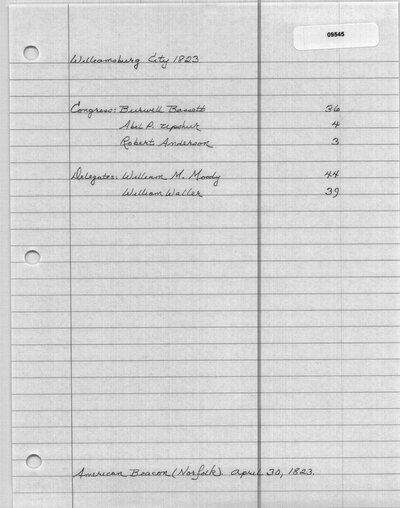 April 22, 1823. Richmond Enquirer (Richmond, VA). May 2, 1823. Providence Patriot, Columbian Phenix (Providence, RI). May 17, 1823.